ASICS Tiger Corporation has more than fifty years of footwear manufacturing experience. They offer a full line of performance-driven athletic shoes, technical active sports apparel and accessories geared toward the serious running and athletic enthusiast. ASICS wanted to develop a solution to enable its sales force to easily learn about the new fall product line. Their feedback indicated the ASICS sales force was looking for a handy, clear and simple reference aid to use when calling on retailers. 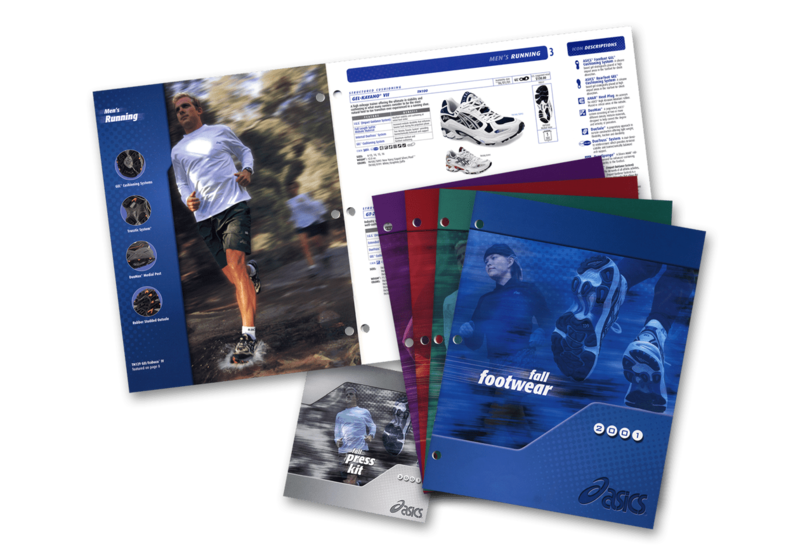 I designed the seasonal sales catalogs with a quick reference flap that allowed for immediate reference and comparison of all ASICS technologies and products. Sales team members were able to immediately and effectively explain the features, functions and benefits of all models, as well as match products with specific end-user profiles. To further enhance product identification and make it even easier for the sales reps to access information quickly, I color-coded product catalogs for each category, such as in-line and team, as well as for the footwear and apparel versions. I also created recognizable icons for all technologies across the brand and designed an easy-to-read chart with the top four technologies for each product. ASICS loved my solution because it made sense, was cost-effective, and was a big hit with the sales force.